Water, water everywhere, but how much should I drink? Hydrating during exercise has received a fair bit of attention of late, with controversy over what, when and how much you should or should not be drinking. A fairly simple truth though is that hydration does have an effect on both health and athletic performance. You just have to get the balance right. When we exercise our bodies generate heat. It’s essential that our temperature is regulated within a fairly narrow range, or we are at risk of heat injury – commonly known as heat stroke or heat exhaustion. Heat injury is unpleasant, potentially dangerous and will certainly impair athletic performance. Sweating is the body’s primary method of cooling and our capacity to cool is therefore in part dependent on our level of hydration – if you don’t have the fluid to lose, your body can’t cool itself. And it’s for this reason that it’s important to maintain an adequate level of hydration when exercising, particularly in warm/hot environmental conditions. Now, British summers tend to be a little unpredictable. Last year’s summer was rather wet and cold, but the top temperature did peak at over 30C. Data from the Met Office shows that the average UK summer temperature is 18.3C, with temperatures in the south of England nearer 20C. So whilst we may feel constantly bombarded by greyness and drizzle, there is actually a chance that a summer race will be a warm one. And combining warm conditions with exercise-induced heat present a real risk for heat injury. So how can you avoid problems with heat? Appropriate gear has an important place, but that’s another story. A sufficient fluid intake will permit optimal sweating and, therefore, maximise your opportunity for cooling. The next – and most important – question, is how much should you drink? Unfortunately, it’s impossible to provide one-size-fits-all guidelines. The amount of fluid you lose is influenced by several factors, including environmental temperature, humidity, gender, body size and composition, what clothing you wear, how well trained you are, how intense you’re exercising and how acclimatised you are to the heat… You can see why a standard recommendation for everyone isn’t really suitable! That said, there are some guidelines to assist in working out what you need to be doing. These are based on hydration before, during and after an event. To assess your level of hydration, look at your urine (it’s not as weird as it sounds!). Urine should be a pale yellow. The darker the urine, the more dehydrated you are. If your pee is the colour of an Oompa Loompa then get some fluids down you! DO NOT overload on fluids – you’ll probably need to pee mid-race, and excess fluids can be more dangerous than dehydration. 5-7ml per kg of body weight, 2-4 hours before the race starts should be sufficient to be adequately hydrated. Unless you assess yourself to be dehydrated, opt for the lower end of the range to avoid the need for unnecessary toilet breaks. You can work out roughly how much fluid you lose during a run by weighing yourself pre and post training. 1ml of fluid weighs 1g, so a 1kg weight loss equates to 1 litre of fluid. Doing this will let you know roughly how much you’re sweating, so you can tailor your fluid intake to match your losses. The general recommendation is to have 400-800ml per hour. Female, slower or lighter runners should aim for the lower end of the range, and heavier/faster runners toward the upper end. Sip drinks rather than gulping – small, frequent sips are ideal. If in doubt, drink to thirst. Normal meals and drinks are usually sufficient to rehydrate. Eating salty snacks can replenish lost sodium and also promote drinking. 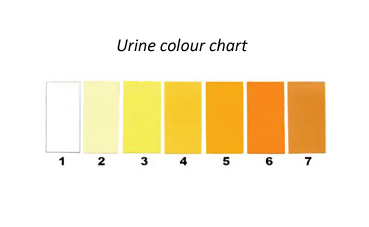 Check your urine colour again. If it’s dark or you go for a long period of time without needing to pee, keep drinking until you produce pale yellow urine. There’s been a bit of debate recently about the benefits, or otherwise, or sports drinks. Whilst there is a lack of evidence to back up some of the claims made by the big brands, for the purposes of hydration, a drink that contains water, electrolytes and carbohydrates does tick all of the boxes. The consumption of electrolytes (such as sodium) and carbohydrates at the same time as fluid has several benefits. Firstly, when you sweat, you lose not only fluid but also sodium. Low sodium levels are potentially dangerous and can lead to the development of a condition known as hyponatraemia. 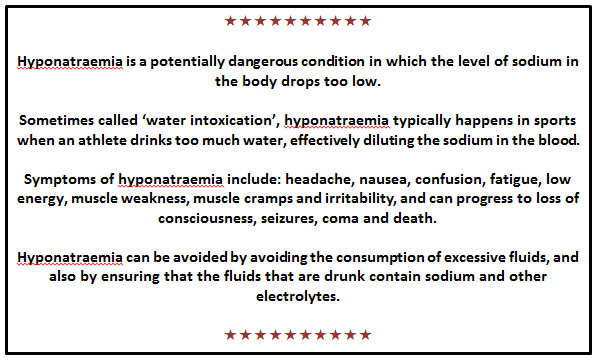 The risk of hyponatraemia is a real one, particularly on a hot day. Drinks can be both refreshing and cooling, and if you keep glugging away then there’s a real chance that some sodium dilution will occur. Drinking an isotonic sports drink is a fairly simple solution (no pun intended! ), as is the use of electrolyte products such as those provided by Sis, Nuun or High5 (other brands available J ). If you do want to combine your hydration strategy with your fuelling strategy, then this can be achieved by using a sports drink. There are lots of brands available – an easy option that ensures you get a decent formulation, convenience and (usually) a palatable drink. 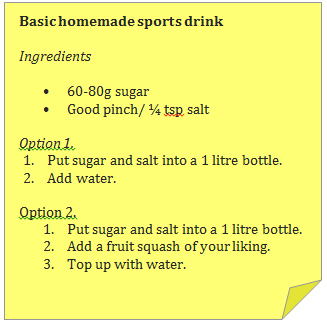 There’s also the option of making your own sports drink. 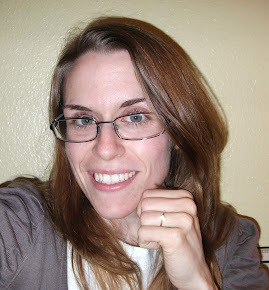 This is usually a much cheaper approach, and can be tailored to your own preferences. Sports drinks are essentially water, salt and sugar, so using those basic ingredients you can make yourself a perfectly serviceable sports drink. Shop-bought sports drinks typically contain: 6-8% carbohydrates and 200-700mg sodium (0.5 - 1.8g salt) per litre, and this is what you want to replicate in a homemade version. Being honest, option number one isn’t particularly palatable. The lack of flavour to override the salt can make it difficult to drink, so adding a cordial of your choice is advisable. An alternative is to use fruit juice. It really is that simple. You can use whatever juice you like and the benefit here is that there is a blend of different sugars, usually glucose and fructose, which can maximise the uptake of energy into your body. A word of warning though – anything you plan to do during a race should be tried and tested before race day. The workings of your gut are very much disturbed during prolonged activity, and gastrointestinal discomfort is common amongst endurance athletes. Don’t let months of training be scuppered by experimenting with a new sports drink on race day! To sum up: hydration is important to sporting performance, which is impaired by both under and over-drinking, both of which have their own risks. A little bit of pre-planning goes a long way in working out what your own needs are, and drinks containing sodium can prevent dehydration and hyponatraemia. And finally, whilst it may seem unlikely, if/when the British summer does delivers on the longed-for warm weather, it’s particularly important to get your hydration strategy right. Apply the Goldilocks principle: not too little, not too much. You want to get it just right.